Earlier this year, Continental Airlines was the first U.S. airline to fly a biofuel test flight with one engine using “a mixture of traditional jetfuel, algae & jatropha oil,” the company brags on TwitPic today. Congratulations! So how does it celebrate its new Earth-friendly mission? 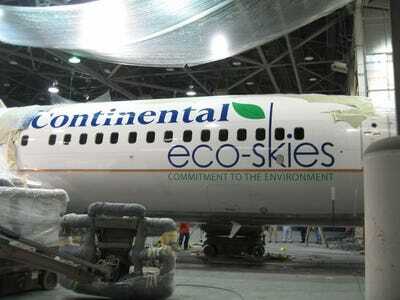 By splurging on a new “Eco Skies: Commitment to the environment” paint job! That’s organic, non-toxic, recycled paint… right, guys?